The weather is still very warm and we are all trying to keep cool but we also need to think about our water usage and try to conserve the water supplies we have available. Please see the list below to find out the small measures you can implement that will make a HUGE difference to our water usage. 1. Collect water from your taps, showers or baths, hand basins and kitchen sinks in a trug or bucket and make use of it for flushing the toilet and watering the plant pots. 2. Keep a jug of water in the fridge rather instead of waiting for the tap to run through cold as this can waste up to 10L of water every day. It is quite trendy to keep a jug of water in the fridge flavoured with your favourite fruit and herbs so why not experiment – lemon and thyme anyone? 3. Take a shower instead of a bath. A bath uses 80 litres of water and a standard shower uses 35 litres, however, power showers can use more water than a bath. Why not challenge your family to see who can take the shortest shower? Make sure you don’t forget to wash behind your ears though!! 4. Make full use of your washing machine – don’t use half loads as this will use more than half the water and energy of a full load. Wait until you have a full load before switching on. 6. Reduce the amount of water used when flushing your toilet by filling a bottle with water and placing it in your toilet cistern, This will reduce the water capacity of the cistern and save water when you flush. There are specially designed products that can be purchased for this purpose and some of the regional water companies offer these for free – please check these can be used with your cistern type before ordering. 8. Refrain from watering your lawn. Grass is a hardy plant and will more than likely recover after a few good rain showers. 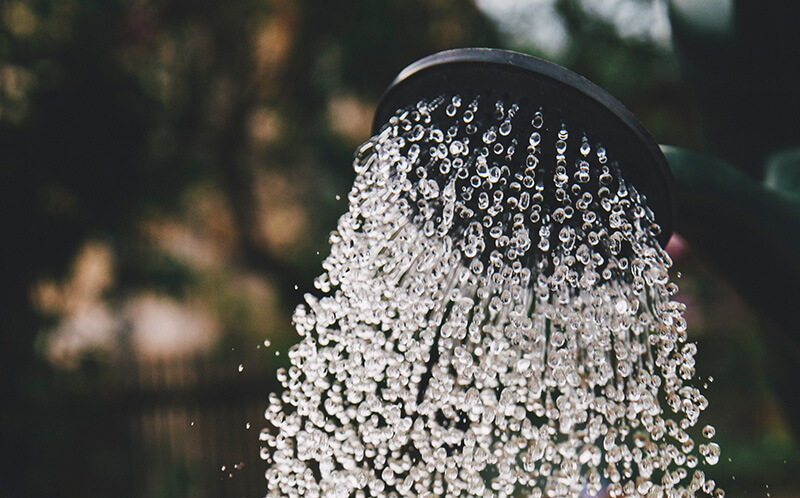 It may not look pretty seeing a lawn that looks more like a beach, but sprinklers can use up to 1000 litres of water an hour which is more than a family of 4 uses in a whole day. 9. Install a rain water collection system to use for watering your plants or washing the car with. Check out the following link for more tips and advice from Waterwise who are a not-for-profit UK NGO focused on the reduction of water consumption in the UK.